2014 is shaping up to be one of Scotland's biggest years yet. All eyes were on Glasgow as it played host to the Commonwealth Games in July, and as a community we really showed what this great country is all about. We’re now into September and this month brings with it one of the biggest decisions Scotland has faced in decades- the Independence Referendum. The National Theatre of Scotland wants to celebrate this momentous year with a season they're calling 'Dear Scotland', which Artistic Director Laurie Samson describes as ‘a season of theatre, debate and celebration’. NTS have been running various events throughout the year for this project and have invited audiences to take part, and now they're inviting you. They're looking for you to share your' thoughts, musings and rants in a note to your nation. 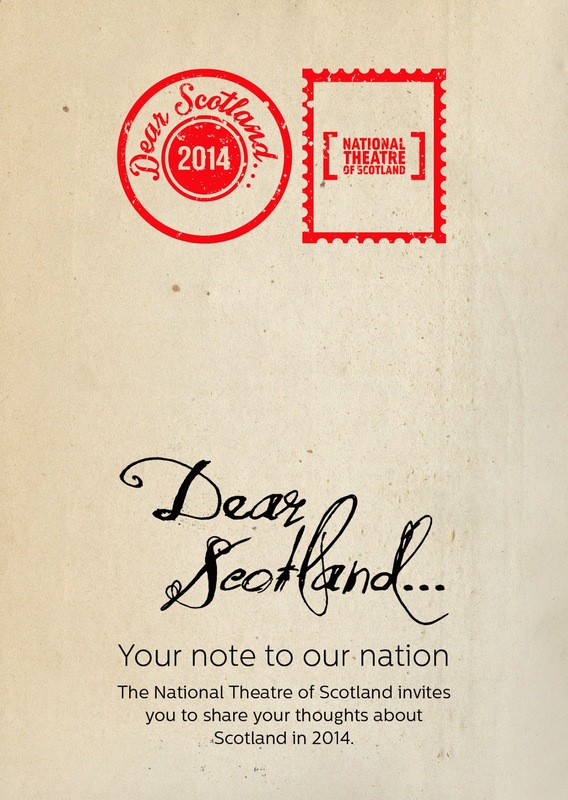 Notes can be text, photographs or videos and can be submitted via http://dearscotland.net/. If you're in need of a little inspiration, check out the monologues submitted by 20 of Scotland's leading writers up on The Space website - http://www.thespace.org/artwork.